Home > Search training results > Outcome Measurement: Clinical Support Tools - What, How, and Why? 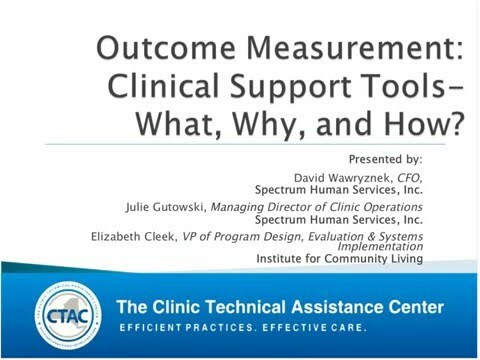 Outcome Measurement: Clinical Support Tools - What, How, and Why? This webinar is designed in response to feedback from CTAC participants who had been requesting information about outcome measures and how to utilize them within a clinic setting. Outcome measures can be a powerful tool, if used correctly, and can help clinicians, supervisors, and clinic management to understand the effectiveness of the care they deliver. Outcome measures assess clinical effectiveness, such as behavioral, cognitive, and emotional functioning, and non-clinical results, such as perception of care. As a result, outcome tools can help assess client-specific factors such as if clients are improving and discharge readiness, as well as helping clinic management to understand what services to offer and staff training needs. We hope that this webinar is particularly useful to clinics who are focusing on increasing their fiscal viability but also want to understand how the changes they are making affects their overall quality of care.